DriverMax - utility that allows to download the latest driver updates for your computer. In addition, DriverMax collects information about installed drivers in system and prints a list of devices that use them. Provides information about the driver version, date, developer, number of files and you have a digital signature. Then you can just export them to a separate folder or packed in ZIP-archive, and after reinstalling Windows to install everything you need from one source. With the Import Wizard can install all the saved drivers just 5 minutes. Thus, you no longer have to have at hand a lot of drives to different devices. 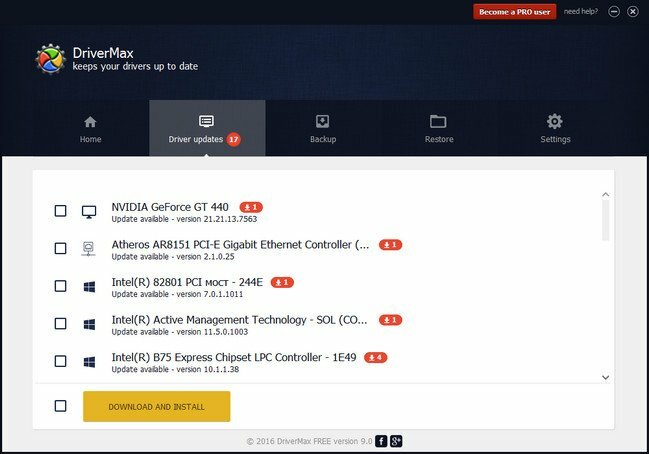 DriverMax is a new tool that allows you to download the latest driver updates for your computer. No more searching for rare drivers on discs or on the web or inserting one installation CD after the other. Just create a free account, log in, and start downloading the updates that you need. DriverMax determines the drivers installed on your system and allows you to archive them in case of system reinstall. The program is very easy to use and allows to quickly install the system drivers stored in the archive. Perhaps you think that will reset all the stuffing, which was on the disk, for example, with a sound card. But this is not the case - will be reinstalled just the driver itself, and multimedia applications, diagnostic programs, and so on - it leaves the program for you. Therein lies the problem. On the other hand, not everybody needs these many programs, and this category of people is familiar with the program, at least for the sake of interest. The program's interface, as well as its organization of work, very simple and ergonomic. Deal with it is not difficult. The program will help you easily and quickly pereutanovit all device drivers that are needed for the correct operation of the devices on your computer in Windows. Just export them to a folder or file, and after reinstalling Windows to install everything necessary from a single source. - Gives details of all drivers, including the version, release date, etc. - Create a detailed report (TXT / HTM) of the drivers. - Make a backup copy of all the drivers installed in the specified folder. - Ability to create an archive with the backups of drivers. - Import Wizard to install the drivers from the saved copy. - Ability to check for the presence of the more recent versions of the drivers.